Complete managed IT support, including server and desktop management, cloud computing, server virtualization, data security, 24/7 helpdesk, and a range of other customized IT services. Backup solutions that include both secure onsite and offsite backup to the cloud for total peace of mind that your company data is safe and can be recovered from any potential data loss situation. 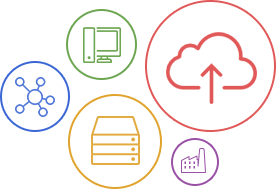 Customized cloud solutions designed to improve performance, lower IT costs, and provide secure and reliable access to your company data from any device, anytime, anywhere. ETech 7 is a managed IT services provider in NYC dedicated to delivering reliable managed IT support and IT consulting to a wide range of businesses. Leveraging state of the art software and world class service, ETech 7 strives to provide reliable solutions for your firm's IT needs. A simple guide to understanding which cloud services are right for your business.